This Chocolate Easter Egg Nests recipe is a simple and fun Easter party idea. Crumble the cereal into the bowl, and be sure to check there aren't any large chunks, because that makes the over all look in the end less cute. Add the melted chocolate to the bowl and mix it well with the cereal. (Tips: make sure NOT to crush the cereal, but work fast so the chocolate won't set up, and make sure every bit of cereal is coated, but lightly, so you can still see how it's "twig-like"). Working quickly so your chocolate won't set, press a spoonful of the mixture into the muffin pan lined with paper or foil cupcake holders and press it down with the back of the spoon to form nest shapes. Set somewhere cool to dry. Put a few chocolate covered raisins (eggs) in each, or use the miniature Easter egg candy that is readily available at this time of year. I always serve this to the little ones in my family, and it's ALWAYS a huge hit! They are so delicious and just so adorable! 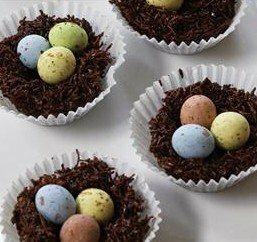 These chocolate Easter egg nests are cute and simple to make. They would make a great Easter craft idea for children that they'd be sure to love - making and eating! Thanks for taking the time to share it with us here. I hope you and yours have a very lovely Easter party this year!